Majority Forward, an "allied organization" of Senate Majority PAC, the super PAC that works to elect Democrats to the Senate, has released an attack ad targeting Rosendale for being from out of state, Roll Call reported Tuesday. Democrats have been attacking Rosendale, the state auditor, for being from out of state, using his past as a land developer to argue he doesn't understand Montana values, especially when it comes to public lands. Democrats have seized on a May story by Talking Points Memo about the Republican nominee never having owned cattle. Democrats are using Rosendale as a foil against Tester, who's running as a longtime Montana farmer. Senate Majority PAC has "shared office space, shared staff" with Majority Forward, which has spent millions of dollars supporting Democratic campaigns and hitting Republican opponents. The group has reserved $1.3 million in ad time over the next couple weeks to blast Rosendale, but it is unclear who is donating to the group because the "‘social welfare' nonprofit doesn't report its donors," according to the Center for Public Integrity. Tester has repeatedly castigated his Republican opponent, and the Republican Party more broadly, for being supported by "dark-money groups," but he has been silent about his own campaign benefitting from dark money. His campaign has also uploaded documents with anti-Rosendale video clips and talking points to his website, an increasingly common tactic that campaigns have used to send messages to super PACs without coordinating with them, which is forbidden. In addition to attacking Republicans about dark money, Tester touted dark money as one of the main reasons that he would vote against President Donald Trump's first Supreme Court justice nominee, Neil Gorsuch, last year. Gorsuch was confirmed, despite Tester's opposition vote. "With Judge Gorsuch on the bench, I am deeply concerned that dark money will continue to drown out the voices and votes of citizens, the court will stand between women and their doctors, and the government will reach into the private lives of law-abiding Americans," he said. Rosendale's campaign slammed Tester for what they described as his hypocrisy regarding dark money in politics. "Jon Tester never misses an opportunity to talk about how much he opposes dark money, and he even used it as his excuse to vote against Neil Gorsuch. 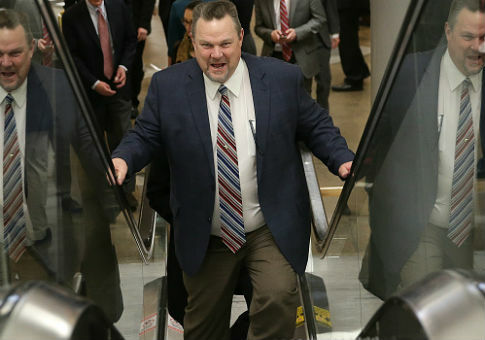 The only problem: Jon Tester's propped up by this dark money," said Shane Scanlon, a spokesman for the Rosendale campaign. "His double-talk is the height of hypocrisy, but sadly this is just who he has become. Tester says one thing to Montanans about dark money but looks the other way when it benefits his campaign." Tester is not the only Democratic senator to benefit from Majority Forward's dark money. The group has spent $2.7 million against Sen. Bill Nelson's (D., Fla.) Republican opponent, current Florida Gov. Rick Scott, on the issue of health care. Like Tester, Nelson has publicly railed against money in politics for several years and has previously slammed the Citizens United v. Federal Election Commission Supreme Court decision for "corrupting our democracy." Like Tester, Nelson was also endorsed by End Citizens United, a PAC focused on getting big money out of politics and electing candidates who want to reform campaign-finance rules. Majority Forward has also spent million of dollars on several other campaigns, including the Senate races in Tennessee, West Virginia, Indiana, Missouri, and Arizona. This entry was posted in Politics and tagged Bill Nelson, Campaign Finance, Jon Tester, Montana, Rick Scott, Super PACs. Bookmark the permalink.